You don’t have to have a historic home in order to enjoy the vintage look of carriage garage doors. However, traditional carriage style doors are typically heavy, expensive, and a bit cumbersome. Fortunately, you can get beautiful roll-up carriage style garage doors in Canoga Park CA that will work with your existing garage door opener simply by calling Carroll Garage Doors. Can’t find exactly what you want in the catalog? Mix and match design elements to create your dream door. We’ll help you with the design and ordering process. Check out our online design center for a taste of the possibilities. When you invest in a new garage door, you need to protect that investment by getting quality service all the way through, from purchase to installation. If you want to get the most out of your carriage garage doors in Canoga Park CA, they need to be installed properly and professionally. You can rely on our technicians to provide a superior installation, whether they are hooking the doors up to your existing garage door opener or installing a new opener. Every garage door installation we provide comes with warranty coverage and free weatherstripping. 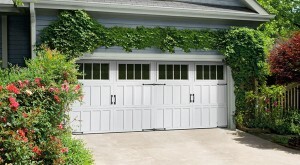 Need Service for Carriage Garage Doors in Canoga Park CA? We are happy to help homeowners who already have carriage garage doors in Canoga Park CA, whether they bought them from us or not. Our technicians are trained on all makes and models of carriage doors, including swing-open and roll-up designs, and can provide all the maintenance and repairs you might need. With over 19 years of experience in the garage door business, there’s no garage door problem we haven’t seen and our expert technicians can help you find the most cost-effective solution to any problem. Whether you are interested in getting brand new carriage garage doors in Canoga Park CA or improving the ones you already have, simply give us a call to schedule prompt and courteous service.